Full audio and the updated depth chart have been posted. • The KU coaching staff’s goal was to hold back and red-shirt one-third of the incoming transfers and play two-thirds of them. The coaches weren’t sure how the numbers would play out. Out of defensive linemen Ty McKinney, Tedarian Johnson, Marquel Combs and Andrew Bolton, the coaches were hoping to play two guys and save two. People were enamored with the names of the guys, while the staff was more enamored with the program. McKinney and Johnson being at KU a semester earlier has them way ahead. The staff thinks Combs and Bolton have huge upsides. • KU was hoping to sit one guy out of the secondary, and because of the NCAA circumstances, now that will be Kevin Short. Before Short was ruled out for the year by the NCAA, the staff thought Brandon Hollomon might sit out this year. Now, he’s playing and playing significant time. Thirteen of the juco guys are a significant part of KU’s plans this year. Receiver Mark Thomas and linebacker Marcus Jenkins-Moore (injured knee) and receiver Nick Harwell (NCAA eligibility) are the other guys that will play a big part in the future. • Running back Taylor Cox had a death in the family last week and flew back to Seattle on Thursday for a funeral. He got back in just before the game Saturday. He has a nagging hamstring and groin. It’s been recurring for some time. If it doesn’t get better, KU will look to medical red-shirt him. If it gets better to the point that KU can play him, Weis says the team will do it. But right now, he would qualify for a medical red shirt, and that’s the direction the team is heading now. • The coaches weren’t pleased with the offensive line play in the last game. Right tackle Riley Spencer was a projected starter who has been slowed by knee ailments. He’s gotten better and better. Spencer is a strong man. Weis says he will bring more physicality. Zach Fondal is more athletic, but Weis wasn’t happy with the controlling of the line of scrimmage against Rice across the board. • Weis says tight end Jimmay Mundine has been moved to second team on the depth chart based on all aspects of his game. You have to go by what you see. Weis sees the same things as the reporters see, only he sees them a lot worse. Right now, Weis says the team has to give Trent Smiley the opportunity to see if it can get any better there. Smiley is more physical than Mundine. Weis wasn’t pleased with the physicality of his team last week. • The changes on the depth chart at receiver has some to do with drops and some to do with receivers not getting separation. The two guys at the top of the depth chart at receiver (Rodriguez Coleman, Tre’ Parmalee) are the two that get open the best in practice. They catch it pretty well, too. Coleman is probably getting force-fed being the No. 1 receiver before he’s ready, but KU needs to get better. KU can’t win games scoring 14 points. • Parmalee runs great routes and catches the football. He’ll never be a burner, but KU needs a guy that can run routes and get open. • Brandon Bourbon and Tony Pierson will have expanded roles this week. Weis said he hasn’t been sleeping well since Saturday night because of the offense. Rice rolled defense to Pierson the entire night. Even on his touchdown catch, Pierson had two guys on him. It’s hard to force feed him the ball to him in those scenarios, because the opponent isn’t respecting that other players can get open. • Weis was pleased with his defense Saturday. The only thing that made him a little upset was some players were a little late getting to the alleys to stop the run. The Rice running back had too many yards. But if you hold a team to 16 points, you should count on winning. • Weis says JaCorey Shepherd is becoming more comfortable with additional time at cornerback. Weis says the team should have high expectations for Dexter McDonald. He’s a big-time player. • Combs is on board with red-shirting. The team doesn’t do these things without involving the player. On the offensive and defensive lines, the guys that are on campus a semester earlier play better. You have to stagger the juco players so they don’t graduate at the same time. KU is taking a-third of them this year and pushing them another year with a red shirt. Combs will play on scout team this year. • Last year, Weis couldn’t identify dropped passes as a problem, because a lot of the passes weren’t close enough to be caught. Now, the ball is getting to the right spot most of the time. 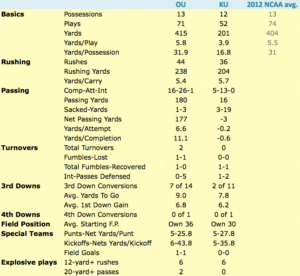 KU needs to be able to throw to score and win games. KU needs to do a better job of executing. That’s everyone, including the coaches. • The Rice game was different than any other loss, because KU’s guys went there expecting to win. They weren’t hoping for something to happen; they were expecting to win. • Linebacker Ben Heeney is playing faster than everyone else. He might not run faster, but he’s playing faster. That’s what Weis is used to seeing in the NFL. That’s how guys play in the NFL. When they come, they’re coming with a vengeance. He’s a pleasure to watch. • Christian Matthews is in the top five of the receivers. He’s involved in some other packages. He’s much more comfortable in the slot than he is outside, but most of the time, Pierson is the guy in the slot. Matthews is still in the mix, though. • KU’s secondary played great against Rice. Linebacker Samson Faifili has been a huge plus. Defensive lineman Ty McKinney has a chance to be a disruptive front-line guy. • Weis is a big fan of KU’s fans. He’s never been in a venue that feels like Allen Fieldhouse, and he’s been to a lot of arenas. Once you start winning more football games, that’s when you can more judge KU’s football fans. Already, Weis likes the support, and that’s with the team losing. Weis has an “incomplete” on his resume, because he wants to see what the fanbase is like once KU starts winning more. The fans, though, have been nothing but supportive from his perspective. • Weis says Nebraska coach Bo Pelini is in a no-win situation. When a former star at the school like Tommie Frazier hammers you in comments, you’ve got two choices: say nothing or say something. Usually, it’s better saying nothing. • Smiley is a short-to-intermediate pass-catching threat. Mundine is more athletic and can get downfield better. But you still have to go by production.